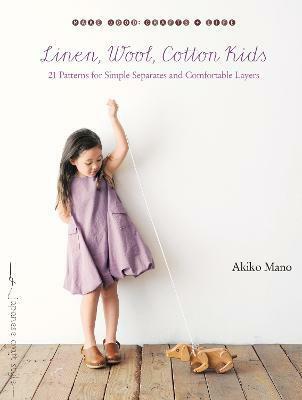 Simple and natural clothes to sew for girls ages 4 to 7--from the author of Linen, Wool, Cotton. From feminine dresses to menswear-inspired outfits, this collection of coordinated separates for girls ages 4 to 7 can be easily modified to suit the season or the child--simply choose basic colors and versatile fabrics for different seasons to make mix-and-match separates. With an emphasis on natural fabrics, these garments are designed to allow the nature of the fabric to come through. These classic styles for dresses, tops, pants, and accessories are the perfect addition to your child's wardrobe. Includes full-size patterns and detailed instructional illustrations: Each garment is accompanied by clear step-by-step instructions, diagrams, and actual-size patterns. AKIKO MANO is president of JAMJAM, a brand of handmade children's clothing and accessories. When she became a mother, Mano decided that there was no clothing available that she considered suitable for her child. She devoted herself to studying pattern making and soon began making children's clothes. Her unpretentiously styled clothing, made with natural materials, has garnered a great deal of attention, and her creations are often featured at promotional events and in magazines.